To make wise decisions about their health, consumers need to know how much their health care costs. That’s the growing consensus from all sides of the political spectrum. But because publishing information about health care costs and quality in the same way it is published for books or appliances is a relatively new paradigm, we haven’t really known how — or even if — this kind of transparent information affects consumer behavior. 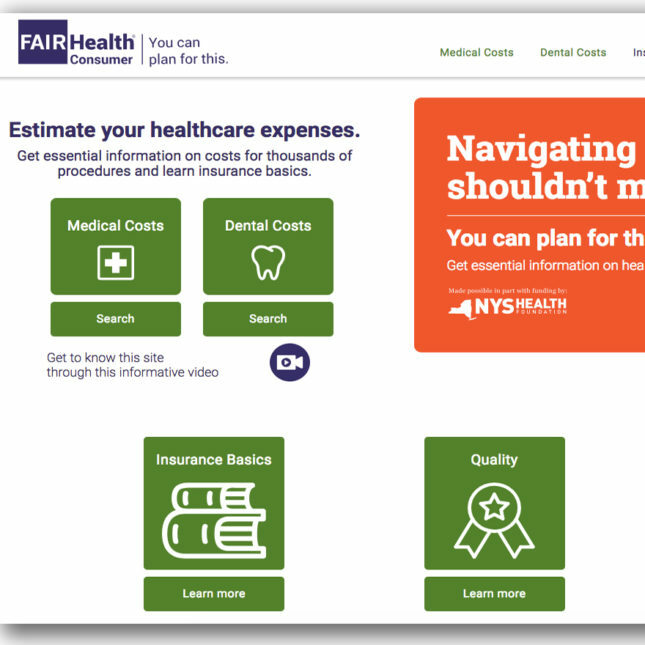 My organization, FAIR Health, recently launched a health care price and quality website, YouCanPlanForThis.org. It is powered by our repository of private health care claims data, the nation’s largest. Other price and quality transparency websites exist, but ours is unique both because the data underlying it are more extensive and because our nonprofit organization is known for neutrality. Aimed at increasing the level of transparency available to consumers, the site provides us with an opportunity to observe the impact of price transparency on consumer behavior patterns. Using website analytics and an embedded website survey, we have determined what types of consumers are using YouCanPlanForThis, how they are using it, and whether their use affects their ability to plan for and manage health care costs. The site has become a living laboratory for researchers and policy makers to better understand how consumers use price transparency tools. What types of consumers are using the site? Most of the more than 50,000 visitors who have used the site since it was launched in September 2017 have health insurance. Of these, 29 percent were looking up costs for providers who don’t take their insurance, while 26 percent were looking up costs for providers who do take their insurance. Only 15 percent were uninsured, while 30 percent weren’t sure whether they were insured or what kind of costs they wanted to look up. Those numbers show that the site can be useful for a broad array of consumers. Say your provider doesn’t take your insurance. You can discover the usual cost in your area of the procedure you need. That can help you budget for the cost, or decide if you want to choose a provider who does take your insurance. The site can also be used to compare a provider’s price to the other prices listed on the site. That can help with negotiating the cost of a procedure. For uninsured individuals who have to pay the full price of medical services, knowing the usual cost can help them plan and also evaluate the value of insurance. Nearly two-thirds of YouCanPlanForThis users are female, confirming the general understanding that women are traditionally the gatekeepers of family health. And about half of the site’s visitors are age 55 and older. This could be because older individuals are more frequent users of the health care system, or that baby boomers are caregivers to both their parents and children, and thus need to be more mindful of health care planning. The average time consumers spend on the site is four or more minutes, which is higher than the industry standard and suggests substantial engagement. And nearly 75 percent of users are accessing the information on their mobile devices, highlighting the fact that all age groups are using mobile devices, at a higher rate than desktops, to access information online. How are consumers using the site? Our survey showed that 75 percent of users said they visited the site to learn about a medical or dental cost where they lived. Some said they intended to use the estimate to plan for a family member or relative; others to negotiate prices with a doctor or hospital; and some to decide whether to obtain a service or procedure. Seventy-eight percent of respondents said they used the cost estimate in the way they had planned, such as planning for the cost of services from a provider who didn’t take their insurance. This suggests that the site is not only providing information to consumers but is providing real help in their efforts to plan for and manage health care costs. Among the most common medical search terms were MRI, CT scan, colonoscopy, physical therapy, emergency room, and ultrasound. The top dental terms searched were root canal, crown, implant, orthodontic, and bridge. Does price transparency influence consumers’ actions? Skeptics say that few people use price transparency tools to manage health care costs. Our analytics and survey counter that claim. At least on YouCanPlanForThis, consumers use price information to plan for and manage their health care costs, and moreover are using it for the reason they intended. Trends we did not anticipate, such as that the majority of users are over 55 and are accessing the site from mobile devices, point to the importance of ongoing empirical research into the effect of price transparency tools on consumer behavior. Because YouCanPlanForThis is a living laboratory, it will take some more time to sift through the results of this social experiment and understand more particulars about how consumers use price transparency tools. We expect that it will continue to show that consumers derive value from such tools and use them to bring greater clarity and precision to their health care decisions. Robin Gelburd, J.D., is the president of FAIR Health, a national, independent nonprofit organization dedicated to bringing transparency to health care costs and health insurance information.